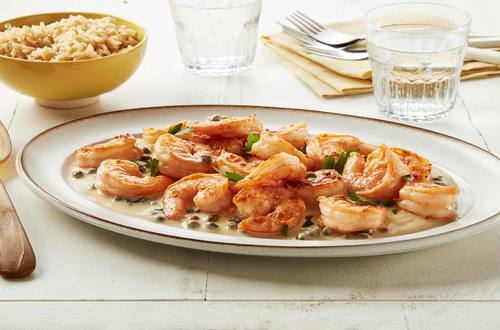 1 Toss shrimp with 1 Tbsp. (15 mL) Hellmann’s® with Avocado Oil with a Hint of Lime. Heat large nonstick skillet over medium-high heat and cook shrimp, stirring occasionally, until shrimp turn pink, about 4 minutes. Remove and set aside. 2 Heat 1 Tbsp. (15 mL) Mayonnaise in same skillet over medium-low heat and cook garlic, stirring, until fragrant, about 30 seconds. Whisk in broth, capers and remaining 2 Tbsp. (30 mL) Mayonnaise and cook, whisking, until hot, about 2 minutes. Stir in shrimp and cook until heated through, about 1 minute. Sprinkle with parsley.